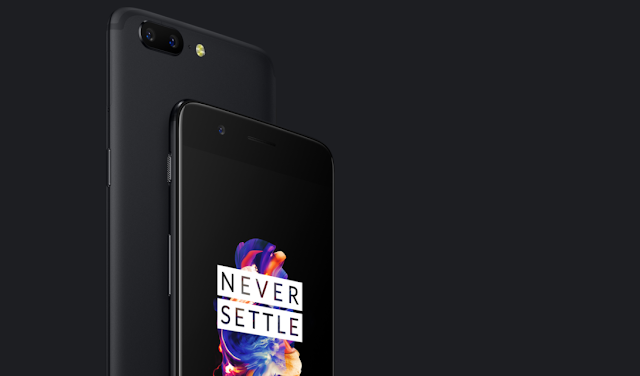 Never Settle: The OnePlus 5 is now official! You are probably watching along to the OnePlus live stream, but the OnePlus 5 is now official with enhanced OxygenOS, Dual Camera, Ceramic Fingerprint sensor, which can unlock your Smartphone in just 0.2s. As for the rest of the story that has been leaked in various forms over the past weeks, this is what we are looking at. So, we have a "new OnePlus smartphone with high-end Specs and friendly price". With the OnePlus 5, you get a 5.5-inch 1080p Optic AMOLED display, Qualcomm Snapdragon 835 processor, 6GB/8GB RAM, 64GB/128 GB storage, 20+16 MP Dual Rear Camera with F/2.6 and F/1.7 aperture for the best low-light, zoom and anti-blur photos with enhanced image processing, 16MP front facing camera, 3300mAh battery with Dash Charge (58% battery in 30 minutes of charging), and Android 7.1.1 Nougat. The OnePlus 5 will be available starting June 27, and will be offered in a rich color palette including Slate Gray (6GB) at £449 and Midnight Black (8GB) at £499. You can get an early access to the OnePlus 5 via Early Drop.